"3LA1, V-202" by Timothy K. Perttula and Robert Z. Selden Jr.
DECORATION: The vessel rim has three alternating sets of closely-spaced diagonal incised lines between horizontal incised lines. The body has a simple incised scroll with hooked arms; the hooked arms are repeated nine times around the vessel body. 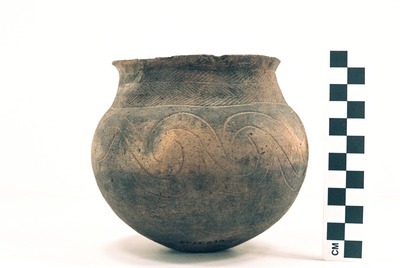 Foster Trailed-Incised or Mound Tract Incised and Brushed jar (5425-639).